I am conflicted about most of Judaism, but I am the most conflicted about Passover. It is a historical fact that the Hebrews were never slaves in Egypt. So, is the Passover story a story of cultural appropriation, of stealing the pain and suffering of others to create a fake historical claim on a piece of land? Or is it maybe an exercise in imagination, an invitation to check one’s privilege, to constantly view yourself as though you could be oppressed, and so must work for the freedom of others? The Hagaddah has weirdly fun dream-like phrases, “An Aramean destroyed my father,” and also un-fun advice on how to abuse your child for asking a question the wrong way. The food is the best (matzo balls! flourless chocolate cake!) and the worst (dry kugel, matzo, matzo, more matzo). As I said, I’m conflicted. For me, the best parts of Passover are the stories. Not the stories in the Hagaddah, which as discussed, are problematic, but the stories people tell about Passover. Every family has them. When my great grandfather, Benjamin Katz, traveled to New York on a buying trip for his furniture store he met a young man, a poor immigrant Yeshiva boy. A stranger in a strange land who had come to this country with his grandfather and sister. My great grandfather invited him upstate to Troy for the Seder. At the Seder, the young man met my grandmother, a “beautiful girl,” what could he do? They were married in June of that same year. Years later, at another Seder in the same big house, my great grandfather, a little fed up with the afikomen shenanigans of his grandchildren (my father, uncle, and cousins) took matters into his own hands. Instead of hiding the piece of matzo for the children to find and re-hide when he went to wash his hands, he put the piece in his vest pocket and took it with him. My father tells this story every year, and every year, I tell it to whomever I am with for Passover. My mother has a story as well. Her father was a career Marine. One year, long before she was born, at her uncle’s Seder they went to open the door for Elijah, and in walked my grandfather, on surprise leave from the Marines. Most years we spend Passover with my in-laws, and they have their own way of doing things. Sometimes at Passover I miss home. I miss my family’s Seder, and I think about the differences in the way I was raised, fully steeped, almost to the point of suffocation, in Jewish tradition and stories, and the way I am raising my children, exposed, but not immersed in tradition. Before I even had children I knew that while raising them to know and understand their culture and tradition was important to me, raising them to become Jewish themselves was not. Judaism and Jewish education has been a fact in our lives, but not a priority. We hae Shabbat dinner every week, unless someone has plans. Hebrew school can be missed for hockey or basketball. Bar/bat mitzvah training is something you fit in around the rest of your life. Hebrew school can be quit once your bar/bat mitzvah is over. Sometimes, when they ask things like, “Wait, which one is Yom Kippur again? Is that the one with matzo or the one where you fast?” it makes me a little sad. This year, we had Passover with my parents. As we went around the table, reading the Haggadah, a different one than the one my in-laws use, my kids started telling their stories. There was a story about Grandma and her play that we are not allowed to act out, and the tambourine she insists on using to sing “Dayenu.” There was a story about the fight that Grandma and Cousin Sarah have every year about Miriam’s Gourd. There was a story about Nancy, a family friend who died this year, and the amazing desserts she always made for the Seder. My parents told their stories, I told my stories, my husband told his stories, and my children told their stories. I don’t know if my children will grow up to have Seders of their own or not. But I do know they’ll remember the ones we’ve had. I know that they’ll remember their parents and their grandparents and the stories of their great grandparents and even their great-great grandparents. They have the stories. As we say on Passover, Dayenu. My uncle once told me a story about a job interview he had in college. Like me, my uncle has a BA in Philosophy from the University of Louisville. At the job interview he was asked “What do you hope to do with that?” To which he replied, “I’ve always thought that commerce should serve education, not the other way around.” He’s in his 60s now and works in IT or Programming, I’m not exactly sure which. But, you know, he has a reputable profession. My uncle is one of my favorite people, not just because of this anecdote. I was thinking about him and the story last night at the parent orientation for high school for my daughter, class of 2020. We live in Oak Park, IL, a suburb with a reputation of being “so liberal even the expressway exits are on the left.” We have super high taxes and an amazing high school with classes some colleges dream of offering. But last night part way through the meeting I said to my husband, “Is it too late to move?” “Up a row?” He asked. “No, like to a commune or something,” I said. For an hour and twenty minutes we were told about everything wonderful our school has to offer and we were told about how important it is for kids to pick their classes with their college majors and choices and their career paths in mind. I have a Master’s Degree and I still don’t know what the hell I should have majored in at college. I’m almost 50 years old and I have yet to pick a career path, does my almost-14-year-old really have to pick hers? Was my uncle wrong? Is even a high school education supposed to serve the needs of commerce? I went to a performing arts high school, where I in fact, had a major, theater, yet I am not a professional actor. I spent some of high school stoned, and some of high school making out in the hallways, and some of high school arguing with teachers, and very little of high school doing real work. My Junior year of high school I left and went to boarding school in Malawi, which meant I never took certain required classes. I did not once think about how any of this would affect my chances of getting into college or my future career path. What’s more, I knew I wasn’t alone in my lack of interest in life after graduation. I’m not saying this is the best way to go about your teenage years. I went to the University of Louisville because it was free for me and because I wanted to get an apartment with my friend instead of living in a dorm. Maybe if I’d thought a little more clearly about my goals earlier on I would have had a richer college experience, and not be struggling so much with my career path now. Maybe I’d have more money or be more satisfied. Maybe I’d be doing great things for the world. When my husband was a child he knew he wanted to be a cartographer. He went to a high school much like the one our children will go to, and he went on to go to three great schools, earn a PhD and marry an undecided slacker like me, so maybe not. Maybe whether you have a plan or not, you can still wind up in a town like Oak Park. I also don’t think it’s an accident that most of my closest friends are friends from high school and college. I don’t think it’s an accident that some of the traits I consider most essential to who I am were formed during this time when I was consciously not busy forming a life plan. I know that my lack of focus as a teenager is a sign of my privilege. My parents were professors and college was an expectation and an easily navigated situation. But the same is true of many more students here in Oak Park than it was of my equally unfocused classmates at Louisville Youth Performing Arts School. The most famous graduate of Oak Park River Forest High School is arguably Ernest Hemingway. He is rumored to have described Oak Park as “A town of wide lawns and narrow minds.” I’m just hoping there’s enough room on those lawns for all of our children. One of my more embarrassing college relationships involved a boy who wrecked my car, while borrowing it to stalk his ex-girlfriend. He was older, having already left one school under dramatic circumstances. We met in a creative writing class and I liked his romantic backstory, his problems with alcohol, his divorce. I was 19, maybe 20, years old, five feet tall and 100 pounds, small boned with short hair and an endless appetite for attention and drama. He described me as a pixie, a sprite, a wood nymph. I liked this image of myself. I liked the idea of being a wood nymph held safe by a dangerous, solid tree of a man. One fall night, when his own car was still operational, we took a stoned drive through a park I’d never been been to before. He liked to drive with the heat on and the windows down. It’s wasteful, but try it just once, you’ll see. We parked and took a walk making up stories about the trees in which the trees were fully verbal characters, bound to the ground. We kissed, leaning against a tree for support. “You are a wood nymph,” he whispered into my hair. “I like kissing you here in your element.” As laughably stupid as it sounds now, I’m sure that at the time it sounded very romantic to us both. Drunk on kisses, romance, and actual alcohol I broke free from him and ran through the park hugging trees. It was the first time I had ever hugged a tree. The next time was in my late 20s in Muir Woods. I worked for a start up that made video games, and we were taken to San Francisco for a launch party. I was a professional writer, on a project that involved launch parties! I was on a glamorous trip, staying at the Ritz! Overcome by the size and beauty of the Redwoods, the excitement of the trip, the thrill of feeling like I was actually successful, the stress of trying to be cool for an entire long weekend, I leaned my head against a redwood and started to cry. “Marta, what are you doing?” someone asked. “You know me, I’m just a hippie tree hugger,” I laughed, ineffectively wrapping my arms around the giant. That was it for my tree hugging, until recently. 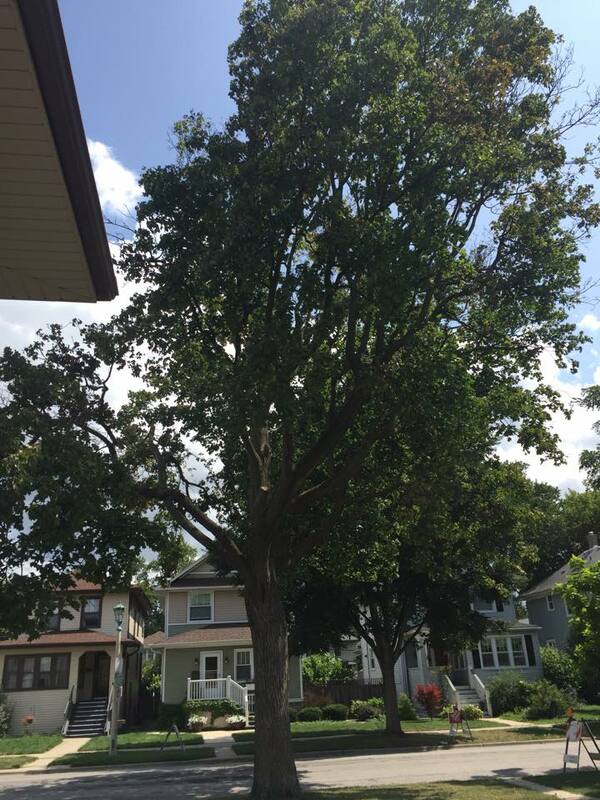 A few weeks ago we learned that a large tree in front of our house would be taken down. It is the third tree we’ve lost since we moved in 14 years ago, the last of the trees that was here when we bought the house. It was my son’s favorite. Once, in kindergarten, he asked if he could just stay home “and watch the trees wiggle,” meaning this tree. As much as I wanted to let him do so, I sent him to school. My son is a hugger. He hugs me, he hugs his friends, he hugs the dog, he hugs his sister, no matter how much she objects, he hugs the tree. Two nights ago, when the no parking signs made it clear the day was close he asked me if I wanted to come outside and hug the tree goodbye. So we did. We hugged the tree, and took a branch, and gathered some leaves. It was his first day of middle school and we were both doing our best to hold it together. Today, while he was at his third day of middle school, workers came and took down the tree. If you had told me in my teens or twenties how brief that time would be, I would not have believed it. It seemed to stretch on forever, an endless searching for people to love me, a search for myself. It’s a cliche, but it was not until I had my own children that I began to see how quickly time goes. Trees are supposed to live for hundreds of years. It does not seem too much to ask that one tree could follow my boy on the brief journey from birth to elementary school to middle school and high school, to his own stupid college romances, and eventually his own children. I never liked the children’s book The Giving Tree. The self sacrificing female tree, the boy who keeps taking and taking and gets away with it … it all cuts a little too close to home for a girl who would loan her car to a guy so he could follow someone else. But today I guess I feel it. Trees have sheltered me throughout my life and I have hugged them three times. It is my reminder that nothing is permanent, not even the trees. It happens at every camp, every year. 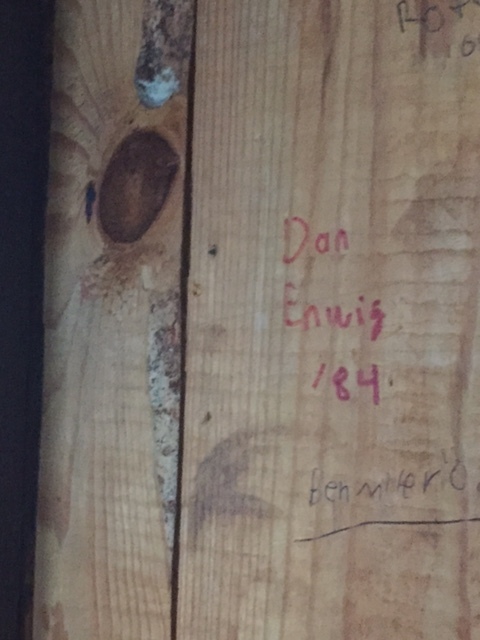 With tools stolen from woodworking or arts and crafts children scratch and scribble their names on bunks, shelves, cabin walls, anywhere they can. The camps try and prevent it, they threaten that any and all graffiti will be photographed and sent to parents with a bill for damages. They make camp-sanctioned plaques that everyone in the cabin signs. The plaques have inside jokes and decorations and the camp hopes it will keep the children from trying to make their mark, but children will always try and make their mark. They scribble and scratch through very camp session, looking for the hidden spot that will let their name stand the test of time. Some imagine that one day a future camper will come along and wonder about them. The future camper will feel a close connection to this mysterious name. One boy carves his name imagining himself 30 years in the future showing his son the hidden relic. He hopes that by leaving his mark, and showing his child how he did it, where he lived, he will have provided the guidance his own father has not. A girl practices her autograph, confident that one day a young girl will sleep here and be amazed that she is in the same spot that once housed the famous actress/model/champion horseback rider/wife of the rock star. Others scribble furiously, desperate to mark and maim the place that has marked them. If their name stands that means they will have survived the stolen underwear thrown on the rafters, the mysteriously-always-wet bathroom floor, the endless bug bites, the slight shift to the right at circle time that forces the scribbler to push just a little too hard to break into the group. One day in a performance review her well-meaning boss will bring up her tendency to push too hard, to lecture when simply asking would have sufficed, to always make her presence felt. Neither of them will know where this tendency came from, never guessing it started here, under a scratchy wool blanket, stolen awl in hand. Some write their names to kill time, waiting for their roommates to sleep. Only in the quiet can they safely bring the image of the waterfront counselor, still dressed in a damp swimsuit with a white t-shirt and the barest of shorts thrown over it, sneaking a cigarette behind the mess hall, to the forefront of their mind. They have held the precious image in the background all day. It would be too much to think of the tall blonde shivering slightly and jingling her anklet with every exhale with the creaking mattress noises of others’ fantasies, and so they write and wait for others to drift off to their satisfied sleep. Some doodle without purpose. They have already developed a casual, cheerful indifference to the world around them. They will continue to carelessly mark the world letting their dirty socks and half-formed opinions litter other people’s pristine floors, leaving their names scrawled carelessly on hearts and walls. And then summer is over. The scribblers, happy, furious, sad, and indifferent go home. Some go home to happier lives full of friends who have never seen them naked, friends who do not find it funny to try and spill their bug juice at every meal. Some go home to fighting parents and vindictive teachers, to bullies who are not impressed by their ability with a canoe. They dare not scribble on walls at school, instead during math class they silently finger the lanyard hidden in their pocket. The maintenance crew will come and seek out the names, scrubbing and spackling them away wherever possible. Early next summer a new group will come, looking to see if their name survived, wondering if they will ever make a mark. Last night my 11-year-old hit a baseball. It wasn’t a home run, he was out at first, but he hit the ball. It’s been a struggle for him since he left t-ball for kid pitch. He loves sports, he loves baseball, he wants so badly to be good at it, but he’s also an anxious kid, a kid afraid of getting hit by the ball. Even now that he’s not as afraid of being hit, his muscle memory still tells him that when a ball is coming towards you, you should get out of the way. He knows more about baseball, about the rules, about strategy, about the history, than a lot of adults, but he does not know how to make himself stay in the batter’s box. There have been games that have left him in tears of frustration. Last night he hit the ball and advanced runners. I was not there. She helped plan the event, but originally didn’t have a speaking role. In her second year of taking a Speech, Drama, and Debate class, she still does not really like the speaking part. Then she discovered she was the only one who could talk about Instagram, and one of the scouts who was supposed to talk about lunch couldn’t make it, so she rose to the task and stayed in the batter’s box and hit the ball, too. Last night, an ocean away, children were being terrorized. It is easy to imagine my own children there, at a pop concert. Maybe I would have taken them, miserable about the idea of listening to the music, giddy at the idea of watching my children enjoy themselves, knowing that this was a step, a stage of growing up that I got to observe. Or maybe one of them would have been asked by a friend and the friend’s parent to go. Maybe they would have been one of the young teens left stranded in a hotel lobby, waiting for a parent to find them, waiting for a parent to explain. I know that other things happened last night to other children. I know children around the world, children close to home were hungry and scared. I know children struggled with fear, and baseball, and an abusive parent, and homework, and war, and entering middle school, and illness, and gossip, and terror. As parents we hold all of these children as close to us as possible. There are times when it hurts too much to look at the children of the world. There are times when it hurts too much to look at our own. Last night children rejoiced. Last night children were killed.